My European show is cancelled… Dang! So, I’ve teamed up with LoudSauce to take my environmental message to the nation’s capital — and buy space on billboards and bus shelters in Ottawa. No government should be able to shut down peaceful, law-abiding artists and writers, especially when we live in a so-called democracy. Free speech and freedom of expression are at risk — while polluters get to pump CO2 into our air for free. We can’t let Harper get away with this anymore. LoudSauce uses crowdfunding to buy media space for ideas that matter. Think billboards and bus shelters — except the ad space is put to good use — literally. Whatever you want to tell the world (subject to a few guidelines) you can do it with LoudSauce. (If people support your project.) Instead of using advertising to drive consumption, it’s about using those big outdoor billboards to inspire civic participation. How cool is that! Imagine if more billboards inspired us to create a better future — for ourselves and others. Could that raise awareness of social and environmental issues? I think so. Are you curious how this billboard plan evolved? My original tour was supposed to launch in Berlin on August 30th, and then travel to art galleries in 20 cities — but all that was thrown out the window when one of the sponsors suddenly backed out on July 11th. So, if I gave up — the Harper Government would have achieved its objective to “Ban Franke James.” And that would be evil. Cue: the guerilla tactics…. Serendipity, Fate or a Miracle? I happened to be in San Francisco when news of the blacklisting broke on July 25th. I had arranged to meet David Hodgson, a green friend from Twitter, at The Hub. Within five minutes of meeting David, he had already shared my blacklisting woes on Twitter and Google Plus. Then he pulled out his Digital Rolodex, and magic happened. He connected me with his network of social entrepreneurs, which included an introduction to Colin Mutchler, co-founder of LoudSauce. Nektarina’s original goal for my art show was to educate and foster “debate among teens regarding climate change issues and to inspire creativity.” However, inadvertently the Croatian NGO was pulled into the crossfires of Canadian politics when they discovered that I was on the Canadian Government’s blacklist. They didn’t relish a political battle with Canada, but were willing to go forward to protect free speech. But I was alarmed to discover the high price Nektarina was paying to defend me. They are suffering political and economic fallout that is risking their very survival. I’ve had a few sleepless nights, lately… When Nektarina and I made the tough decision to cancel the European tour, I knew I had to turn to my social networks to put a grassroots, guerilla plan into action. LoudSauce is part of that plan. And there’s more to come. Wherever you are in the world, I invite you to contact me with your suggestions. Ironically, if the Canadian Government had just let my touring art show go ahead, you probably would not have heard about it. That’s because the educational goal of the art show (inspiring teens to make their own climate change art) doesn’t make headlines. When the show was originally conceived it was not political at all. Everything changed when I heard I had been blacklisted. That’s when I decided I better live up to my reputation and throw Fat Cat Canada and Dear Prime Minister into the mix – and show the full range of issues that I care about as a Canadian citizen. Thanks to everyone who tweeted, ‘liked’ and G+’ed! Thank you to everyone who has tweeted, “liked” or G+’ed to help spread the word about my blacklisting. Your support has been amazing! It’s clear from the outpouring of support — the 1600 votes on Care2 (big thanks to Cathryn Wellner for writing the letter) and the hundreds of people signing the Care2 petition — plus the many blog posts and comments left on my site, that this censorship issue has hit a nerve. This isn’t what we think Canada is about. Aren’t our leaders supposed to be above partisan politics? Aren’t Canadian Embassies supposed to be there for all Canadians, of all colours and stripes? Not just the ones who wear Tory Blue! Please leave your comment below about this blacklisting. Share this blog post on Google Plus, Twitter and Facebook. Make a pledge on LoudSauce. Thanks for your inquiry. I know that it’s hard for you as a Conservative supporter to believe that a fellow Canadian is being treated differently than you would be in the same situation. It doesn’t seem fair does it? It’s un-Canadian. It goes against the promise that Harper was going to bring transparency and fairness to Canadian politics. If you were in power you wouldn’t let that happen would you? At first I was skeptical that the Canadian Embassies would be so hostile to “me”, a Canadian citizen and business-owner. I’ve even led a Trade Mission to Los Angeles a few years ago… So, I approached them myself asking if they would host a press conference to announce my show (as they do for other artists and authors). Surely, they will greet a Canadian artist with open arms? But no… I was rebuffed on the phone, and by email. None of the Canadian embassies wants anything to do with me or the show. Not one embassy has agreed to honor the event. They can’t even offer me a handshake, which seems very strange and very ‘un-Canadian’. 1. My company’s registration with the Virtual Trade Commissioner Website so that all correspondence would be tracked. 2. The email that Candice Rice, Trade Commissioner in Ontario sent out on my behalf to 7 Canadian Embassies (which included the sponsor’s name). 3. In that same embassy letter, Candice Rice identified me as an “Environmental Crusader.” A label that was sure to raise red flags in the Embassy. Why would she do that if she was trying to get support for me? 4. The email thread that Olivier Roy, Cdn Embassy Trade Commissioner in Berlin and I had. His initial enthusiasm quickly turned to evasiveness and denials that he could authorize any event for me. 5. An email regarding the phone meeting I had with Roy on July 11th. 6. Other Cdn Embassy emails that I received in response to my request to have a press conference at their embassy at my own expense. None have agreed to allow me to rent space at a Canadian Embassy. I don’t know what you do for a living, but from my experience as a creative professional the show was very doable. I was confident that Nektarina could organize the tour because I’ve organized many ambitious projects — including an award-winning touring show that traveled across Canada. Why couldn’t they? Think of a movie production. To accomplish an ambitious project (like a film or an artshow) you have to draw on talent from many sources and bring them together for the project. You don’t add overhead — you outsource. 1. Nektarina was buying my work outright. We signed a letter of agreement in March. 2. The major funder of the project was a private backer with decades of experience in the art gallery business. 3. The corporate sponsor was only paying a fraction of the total costs to travel to 20 cities in Europe. However, their sudden withdrawal was a blow. 4. The bullying phone call by the Canadian Embassy staffer to Nektarina’s mobile phone on July 14th. I have shared the name with media who call me. 5. The Canadian Embassy in Croatia had indicated verbally that Nektarina’s written proposal for a $5k grant would get approved. 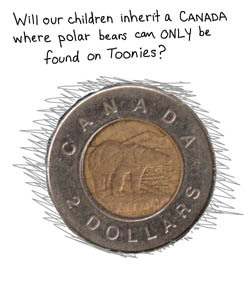 Canadian Embassies have funds to use to support educational projects on climate change. Their support was withdrawn with the memorable words: “Who was the idiot who approved an art show by that woman, Franke James?” That quote was relayed by the same Embassy staffer who made the bullying phone call on July 14th. At the end of the day it does seem very strange and very un-Canadian that NO Canadian Embassy in Europe has agreed to host an event for a Canadian artist having a 20-city European tour — even when the artist said she would pick up all the costs. However, I have not given up on PM Stephen Harper. I’m expecting his call any day now telling me that I was mistaken — and the stonewalling and negative treatment I received was all an embarrassing mistake by his people on the ground. I am sure he’ll give me a warm handshake when I go to Ottawa. If you have a good relationship with Mr. Harper why don’t you tell him to give me a call? Or send me an email? Considering that the tour is now cancelled, perhaps Mr. Harper would like to attend my art show in Ottawa? A warm handshake would be most welcome. If he can’t come to me, then I would love to drop by the Parliament Buildings and say hello. No taxpayer dollars of course — I’ll even buy him a coffee to show there’s no hard feelings. Go Franke!! You are always my inspiration for doing “the hardest thing first” …but you make it look easy!…Reality can’t hide, and you put the Climate Crisis out for all of us to see in a very clear and right to the point way….Can’t wait to “see the billboards” – post pictures….sending tweets and FB about your new venture. Special thanks to the Harper Govt for making your wonderful visual essays more accessible to all! Franke, I submitted your story to Boing Boing. If anyone can help, it’s Cory Doctorow (see: http://xkcd.com/345/). Best of luck! always voting for the environment and against polluters, you have our support! 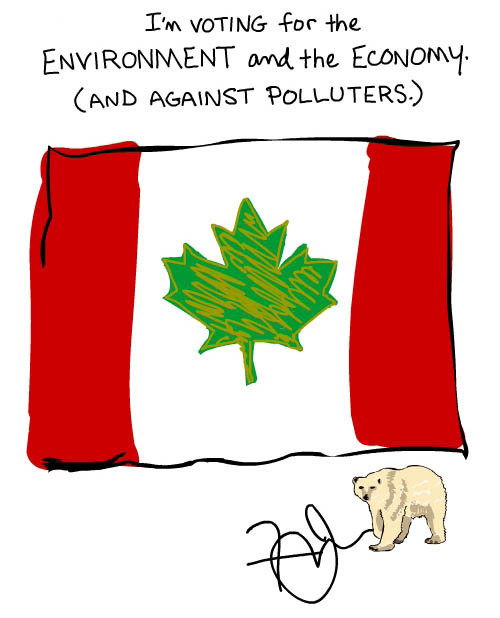 It’s bad enough that Harper isn’t doing anything about the environment himself. He doesn’t need to silence people that are trying to spread the message as well. Why goes it always seem that backwardness and ignorance go hand in hand with conservatism — does it have to be this way? The more I read about Harper, the more corrupt he seems to have gotten. It’s like he’s trying to rule Canada with an iron fist or something. And, of course, we must all bow down and worship the almighty oil companies who are getting our oil essentially for free, since they get all those government subsidies and grants and so forth. Never mind about freedom of speech, expression, or even our health for that matter. 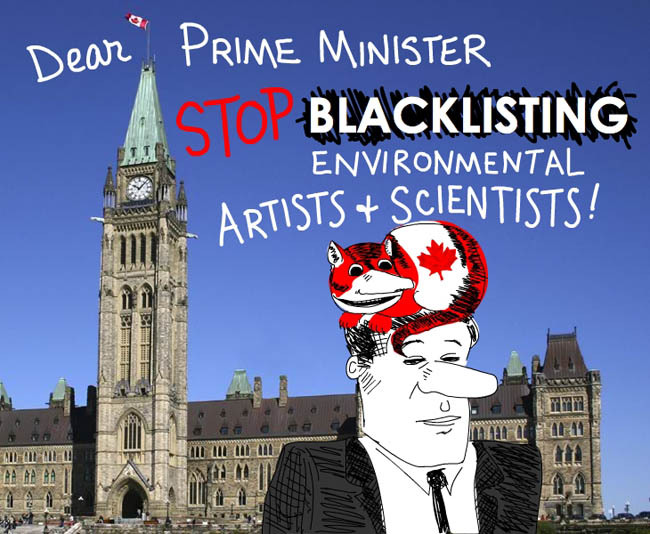 Let’s keep blacklisting our artists and controlling what our scientists are saying. How can this be considered a free country anymore? I support you and your mission. Keep on fighting the good fight, not just for the environment, but for democracy as well. This action by our government is outrageous. This is a direct assault on democracy and is outright overt FASCISM plain and simple. I urge Canadians and other nations to wake up and not let our freedom be hijacked by a minority group of corporate elites. It appears that Canadians want to be Americanized. You need to get to the root of that problem if you intend to save Canada. Remember that they blacklisted the story of Tommy Douglas too. Maybe you can use it as a fundraiser (remembering to put a disclaimer in the front of it), in local theatres or legion halls. We are losing our health care even more rapidly than our air. I do have a copy if you can get Shirley Douglas to support it. It’s a damn shame we have such a crooked government in Ottawa. Honest people have to stand up to their bullying and make sure they don’t return to power in the next election (and are caught for every illegal action they make too, in the mean time). Congratulations on your art creations and your efforts to bring your important show into the public sphere. It is so important that we all become aware of the contradictions of our government which claims environmental responsibility and taking care of the economy while it does the exact opposite. Harper is doing an excellent job of being a Bush-wannabe. May you have great success in your art and in stimulating clear and accurate consciousness! hi, good luck! I will pass the word around! I quite like your material! I am one of those green party people who put in a few cents worth of time helping elizabeth may get elected..
I’m so disturbed and disgusted by this “Government Blacklist”; I never imagined this could happen in Canada. Congratulations, Franke, for standing up for this country, even as the rug is being pulled out from under us in closed-door, backroom deals, I see hope in your grassroots movement. I fear our Prime Minister cares nothing for the people and culture of this country. It’s no wonder so many people feel powerless. How could our own Government have betrayed us, like this? It seems, as a people, we must be willing to fight everyday, tooth-and-nail, against our own deceptive and self-centered Government for the country we love, to survive. Thank you for the rally-cry, and eye-opener – we certainly have lots of work to do!! !